Let the cranberry posts continue! 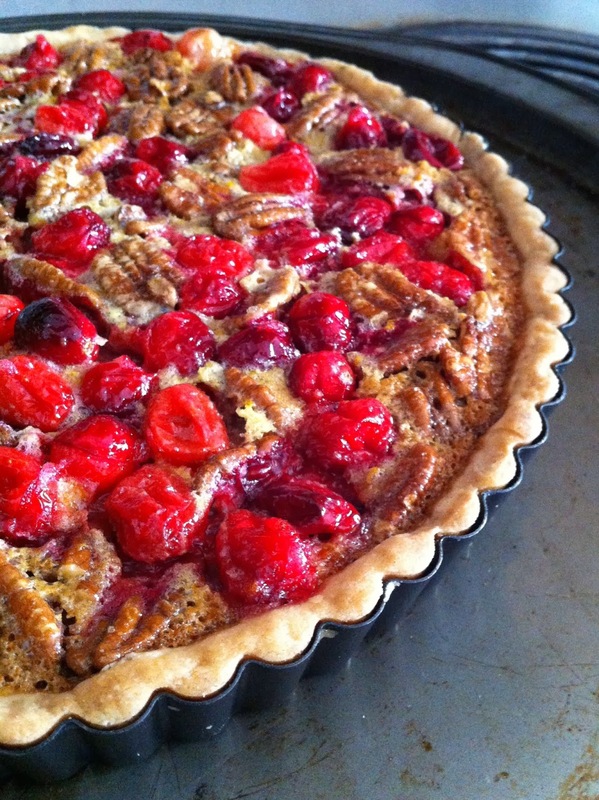 I made this tart a couple years ago, using walnuts. 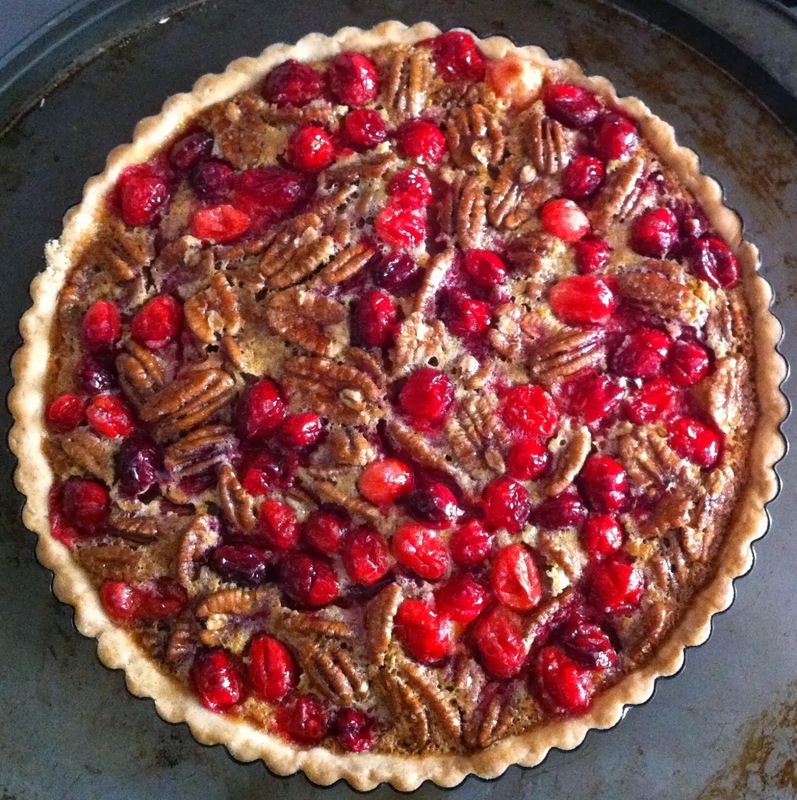 I absolutely love pecan pie, so I figured I would give it a try with a different nut. 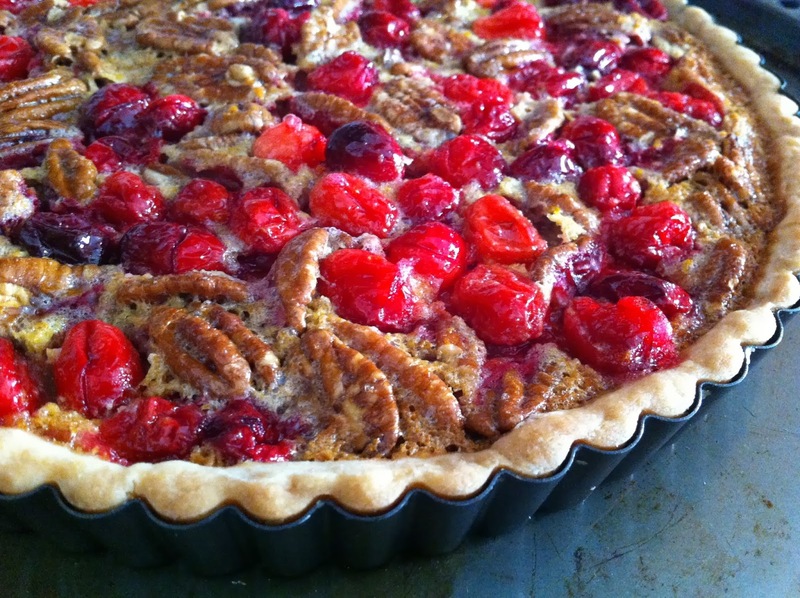 The orange zest gives a nice hint of citrus to balance the sweetness of the filling and tartness of the cranberries. And the buttery crust is as delicious as it is easy – no rolling required! Adapted from these two sources: Chow and TasteOfHome. In a large bowl, stir together the butter, sugar, and salt until incorporated. Add the flour and stir until just combined and a soft dough forms. Spread the dough into the bottom of a 9-inch tart pan with a removable bottom. Press the dough evenly on the bottom and up the sides of the pan. Poke the bottom of the crust all over with a toothpick (to allow steam to escape and avoid the crust bubbling up while baking). Line with foil or parchment and place pie weights on the bottom surface (if you have them…this will help prevent the shell from bubbling up or shrinking while baking). Bake about 10 to 15 minutes. Remove from the oven and allow to cool while making the filling. In a large bowl, combine the sugar, corn syrup, eggs, butter and orange peel in a large bowl. 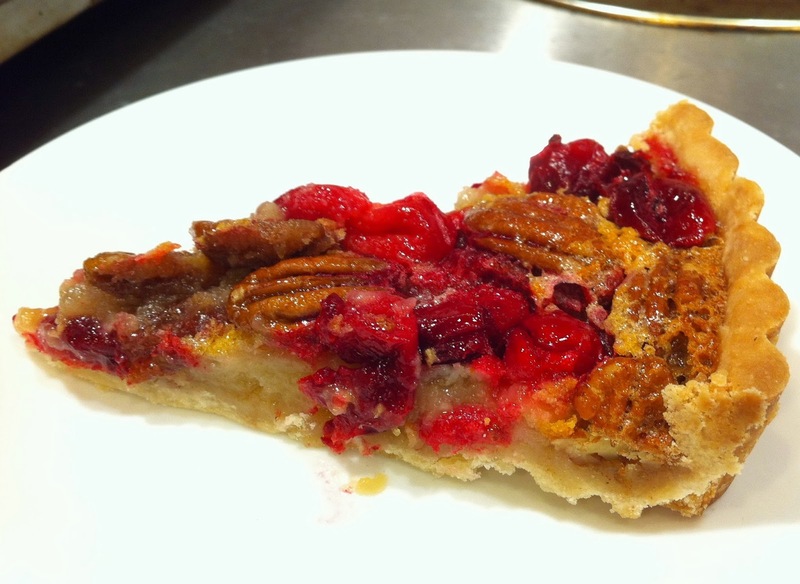 Arrange nuts and cranberries evenly in bottom of crust; pour sugar mixture over the top. Bake for 30-35 minutes. Crust will be golden, edge of filling firm, and center is almost set. Cool on wire rack. Store in refrigerator until serving. Cut a slice and enjoy! Every time I have bananas that get ripe before I can get around to eating them, I mash them and freeze them to make banana bread later. 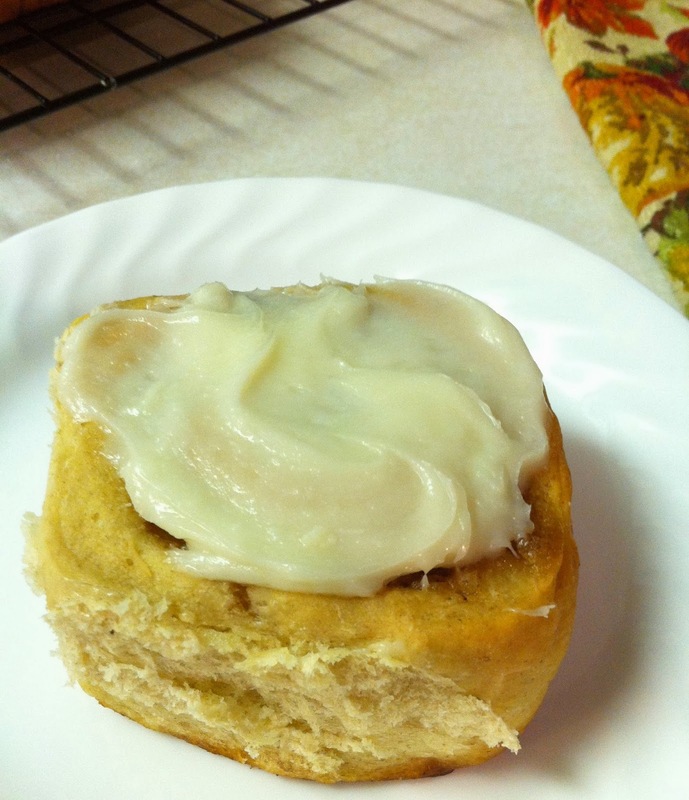 I’ve been looking for a different take on traditional banana bread, and thought cinnamon rolls made with bananas in the dough would be an excellent choice! These smelled great baking in the oven! 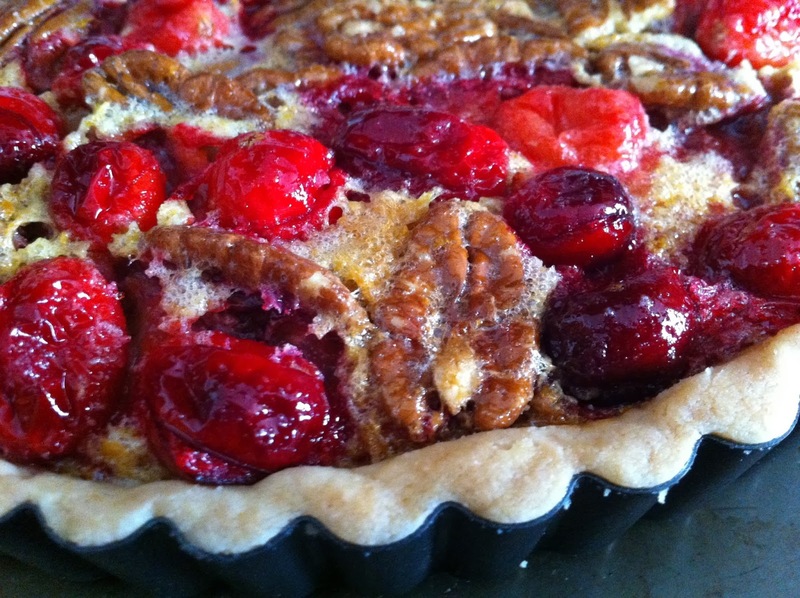 Next time I think I’ll add some walnuts or pecans to the filling. In a 2-cup measuring glass, combine the milk, sugar and yeast. Set aside for about 10 minutes to proof. To the yeast mixture, add the bananas, butter, oil, and egg. In a large bowl combine 2 cups of the flour and salt. Pour the wet ingredients over the dry ingredients. Stir with a spoon until combined. 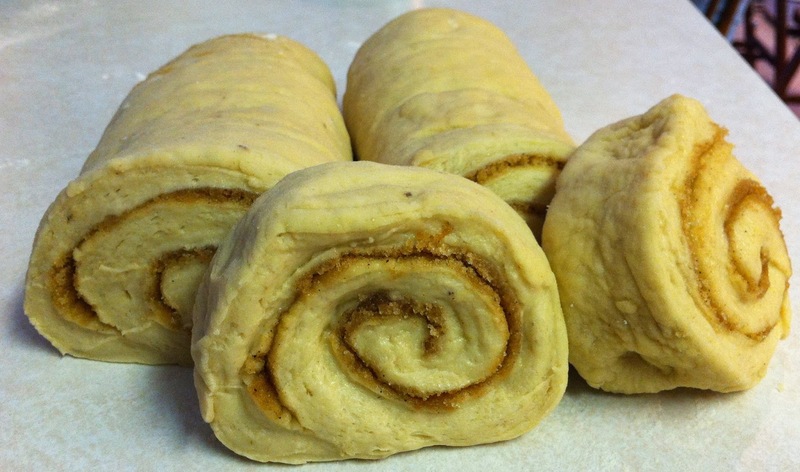 Continue adding flour until it forms a dough that is not sticky. Knead the dough on a floured surface for about 10 minutes; a smooth dough will form. Place the dough ball into a lightly floured bowl and cover with plastic wrap. Allow to rise in a warm place for an hour or two, or until it has doubled in size. Punch the dough down. 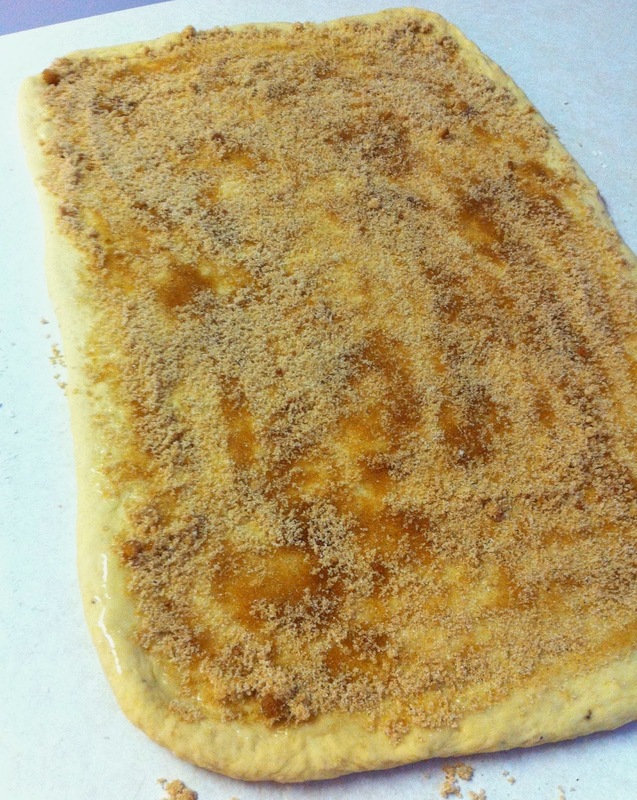 On a floured surface, roll the dough to about an 18 x 24 inches rectangle (doesn’t have to be perfect). For the filling, mix together the sugar and spices. Brush the dough rectangle with the melted butter. Sprinkle evenly with the sugar mixture. 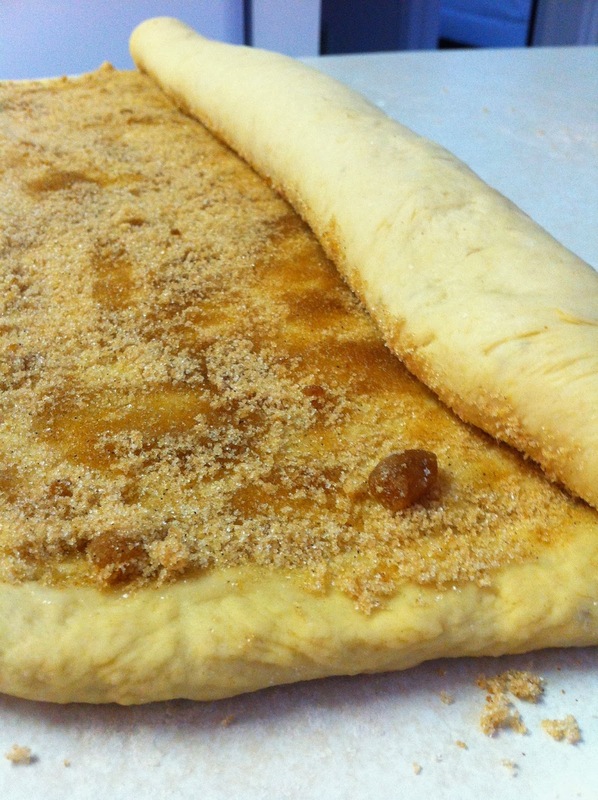 Roll up the dough along the long edge. Use a sharp knife to cut the log into 12 even pieces. 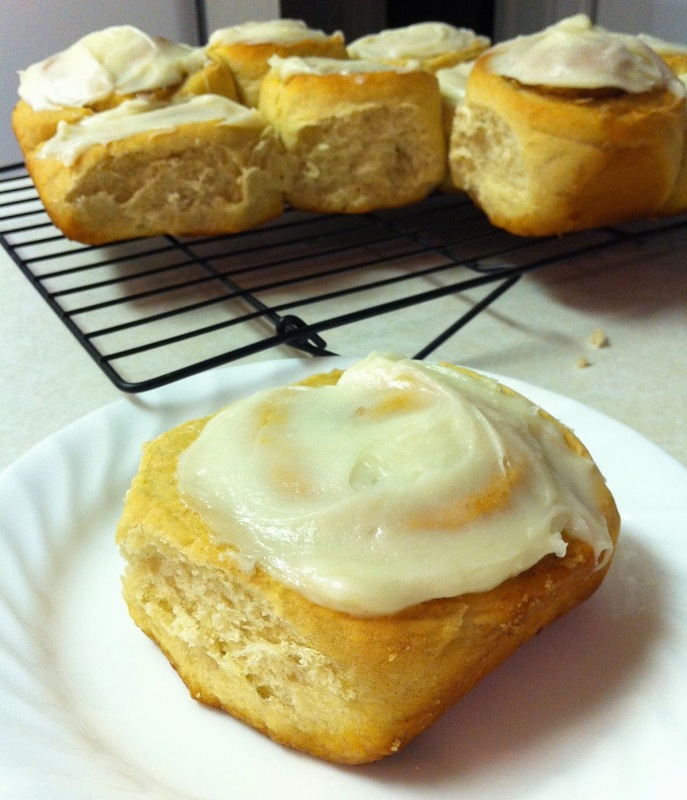 Place the rolls into a greased 9×13 pan. Allow to rise for about 15 minutes or until they start to get puffy. Bake in your preheated 350 F oven for 22 to 24 minutes, or until golden brown. 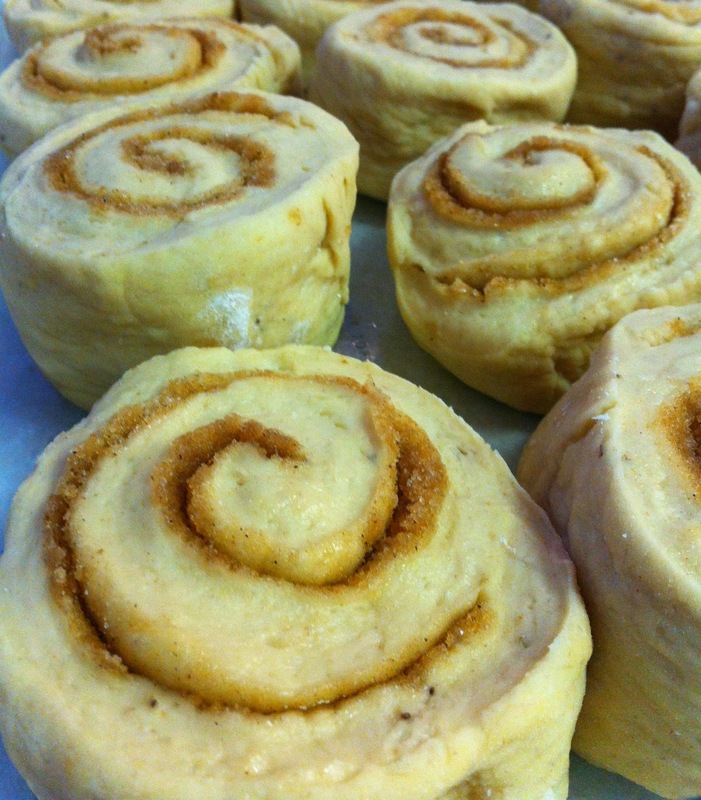 Allow to cool slightly before frosting. For frosting, combine all ingredients in a medium bowl with a fork (or hand mixer). 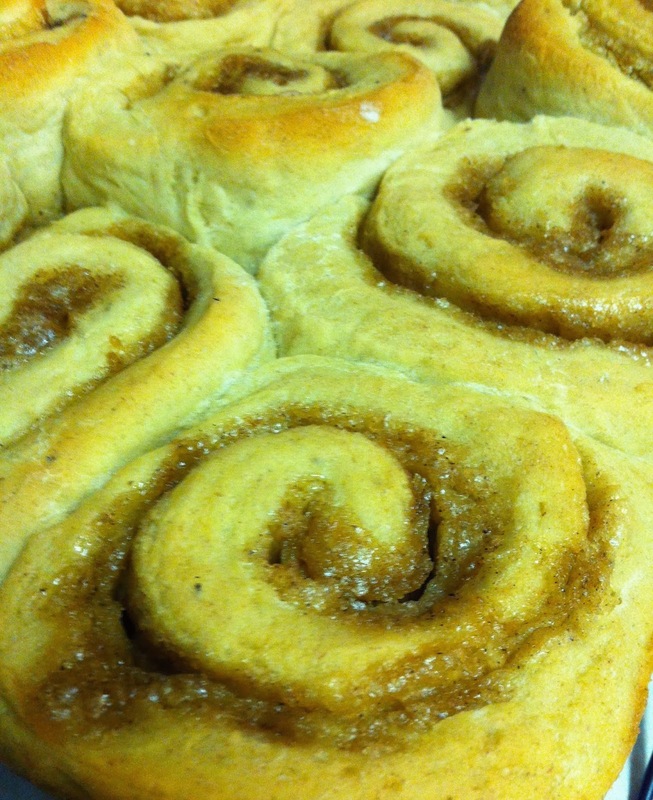 Spread evenly on the rolls. 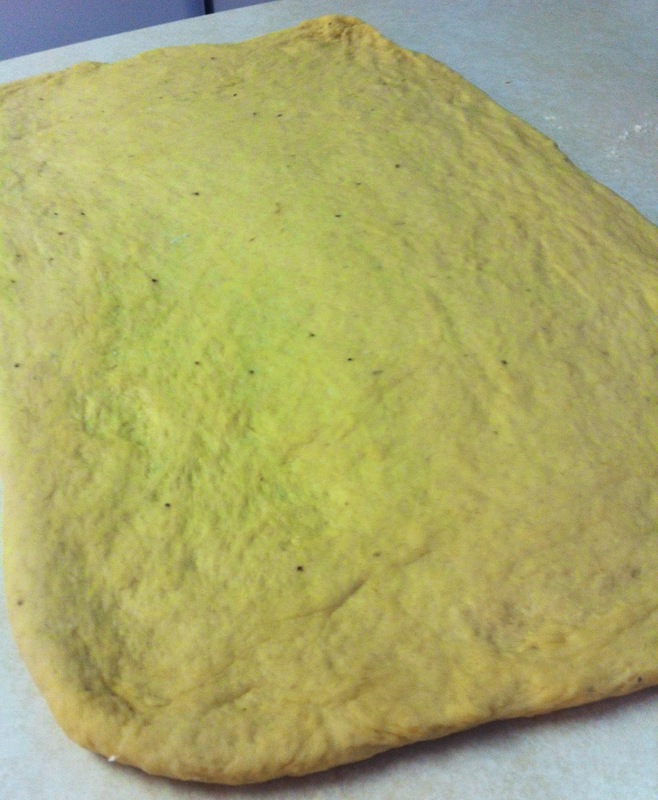 Rolling out the dough…you can see the specks of banana seeds! Brush with butter and then sprinkle with the spiced sugar. Roll up the dough, starting with the long end. Slice the log into 12 buns! All lined up and ready to go! Allow them to rise and get puffy before baking. Mmm smells like banana bread. 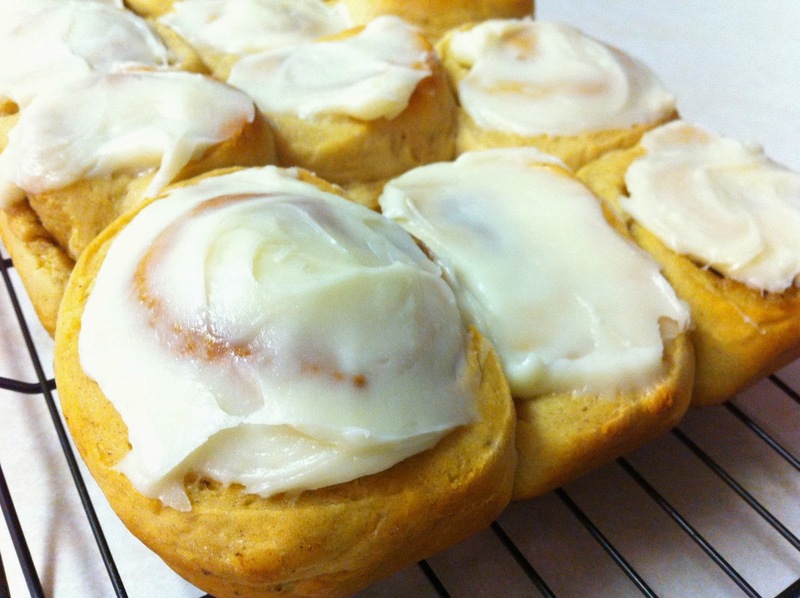 Frost them after they’ve cooled a bit. Break one off and enjoy! 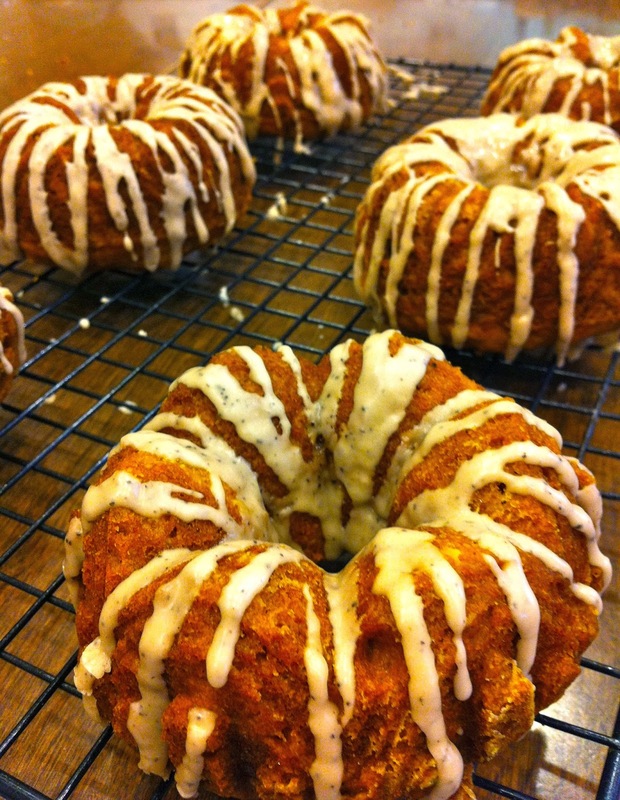 I absolutely love pumpkin baked goods! 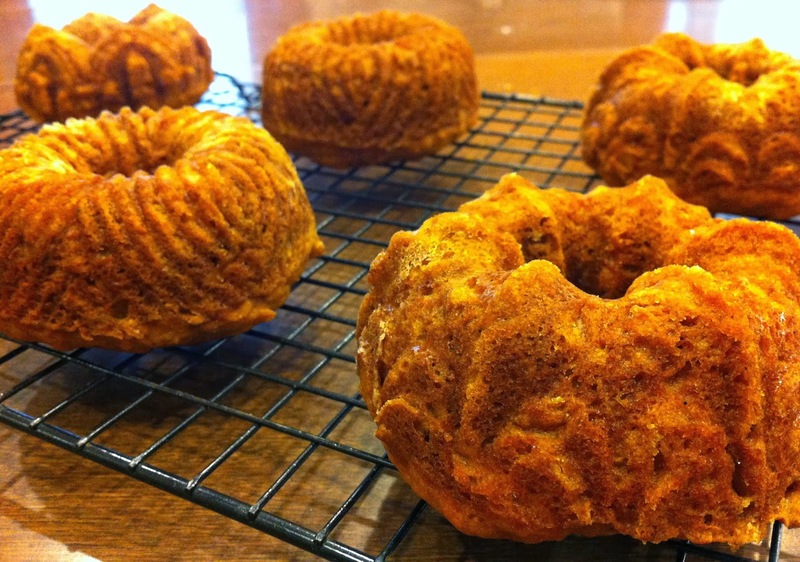 I’ve been wanting to use my adorable mini bundt pan, and my favorite pumpkin cupcake recipe seemed like it might be the perfect choice. 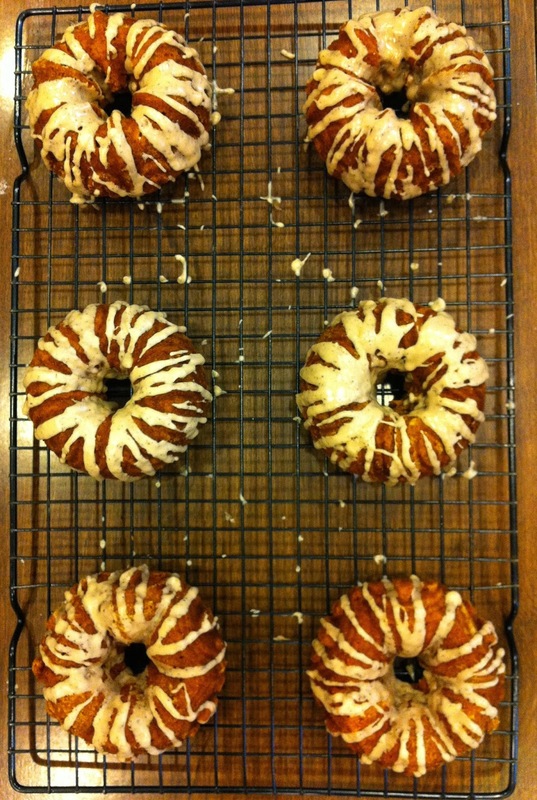 You could do a maple or cinnamon frosting, but I thought the latte frosting was a very clever idea! Preheat oven to 350 degrees. 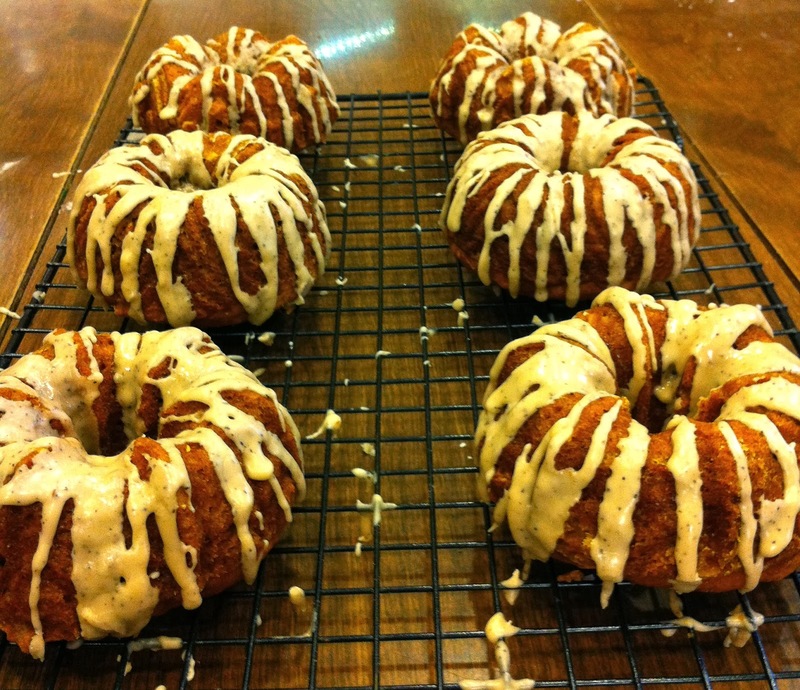 Generously spray a 6 cup mini bundt pan with cooking spray and sprinkle with flour. Alternatively, line a 12-cup standard muffin tin with paper liners. 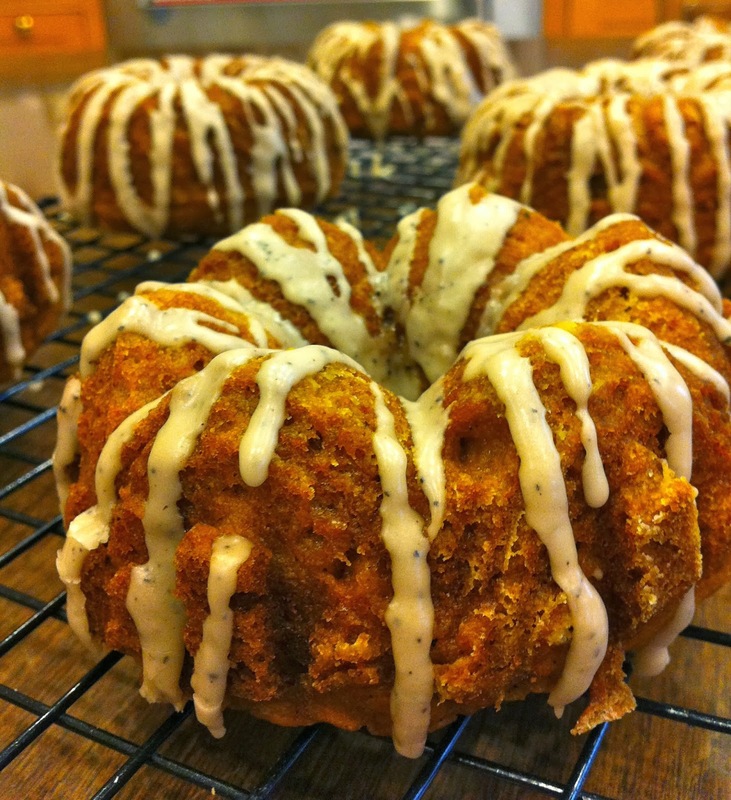 In a large bowl, combine flour, baking powder, baking soda, spices, and salt. In a large glass measuring cup or another bowl, combine the pumpkin, sugars, vegetable oil and eggs. Pour wet mixture over dry ingredients and stir just until moist. Scoop the batter into the prepared baking pan. Bake for 18 minutes, or until a toothpick inserted in center comes out clean. 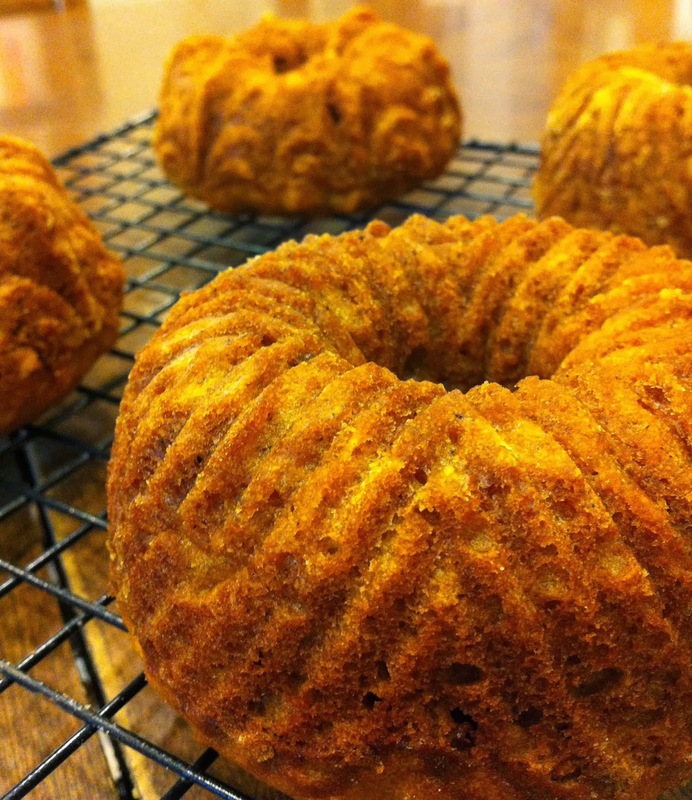 Remove cakes from pan and cool on a wire rack. Mix together the frosting ingredients to form a nice drizzling consistency and apply to cakes. 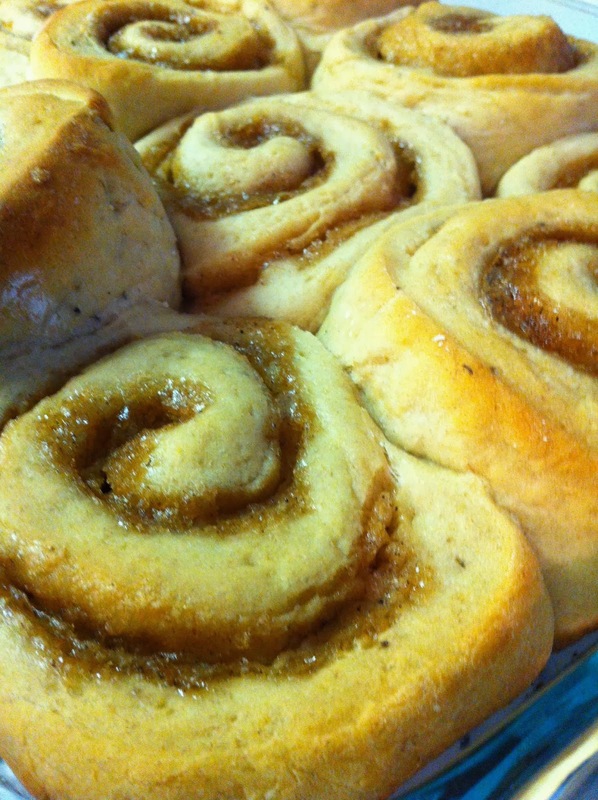 Yum fresh from the oven! The view from 10,000 feet. So pretty all in a row…Enjoy! I love fresh basil! So much so that I bought a plant at the store for a couple dollars and have been trying to keep it alive since summer. But alas, basil likes a lot of sun and hot temperatures, which is just not in the cards this fall. This is why I find myself trying to consume an entire basil plant, which isn’t as easy as it sounds (just kidding, sort of). 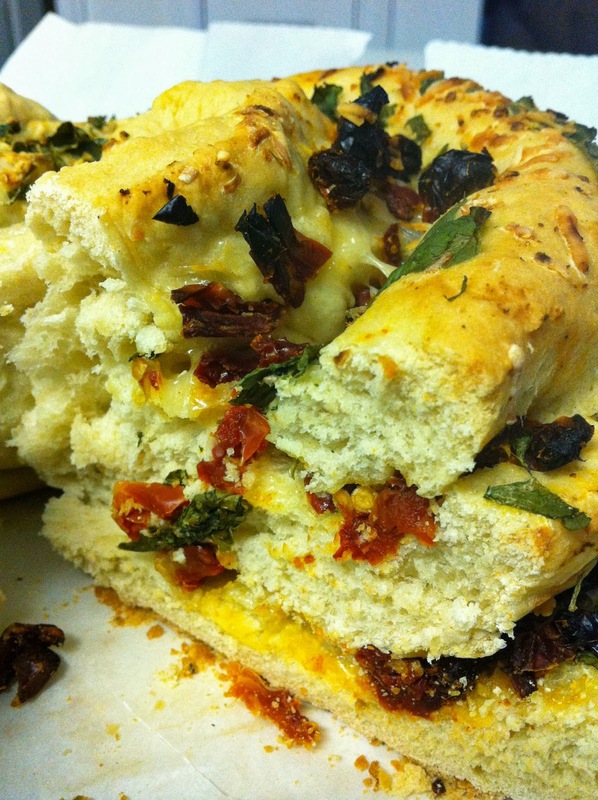 This bread is very flavorful thanks to the herbs, sun dried tomatoes, and cheese. And it’s really not that hard to make but looks very fancy! Ideas combined from here and here. In a 2 cup measuring glass, combine the water, yeast, and sugar. Let proof in a warm place for about 10 minutes until it becomes bubbly and starts rising. In a large bowl, combine about 2 cups of the flour with the salt and herbs. Add in the egg, olive oil, and yeast mixture. Mix to combine. Add in the remaining ½ cup flour (more or less) until a dough forms that doesn’t stick to the sides of the bowl. Knead the dough on a floured surface for about 10 minutes. 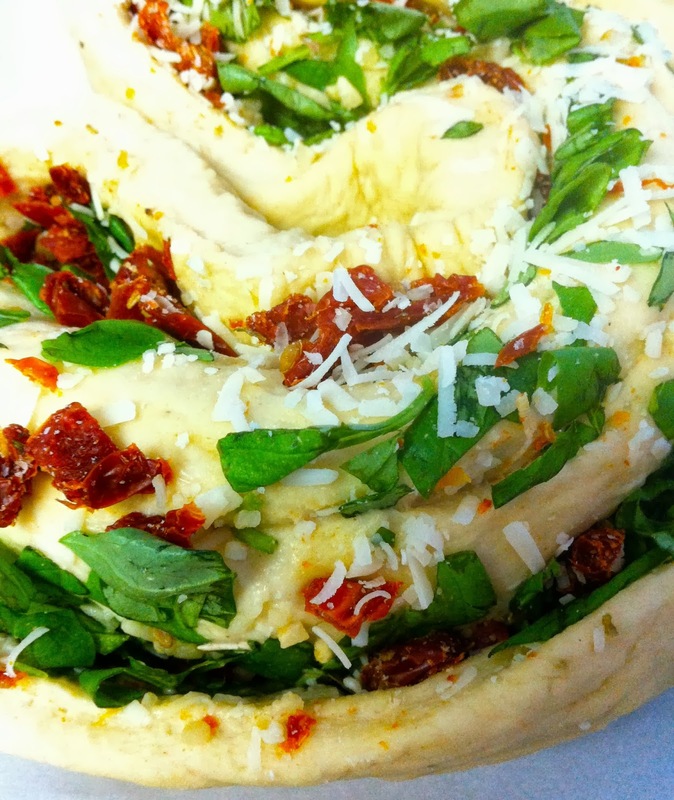 A smooth dough ball will form. Place the dough ball in a lightly oiled bowl. Cover with plastic wrap. Place in a warm place and allow to rise for 1 to 2 hours, or until about doubled in volume. 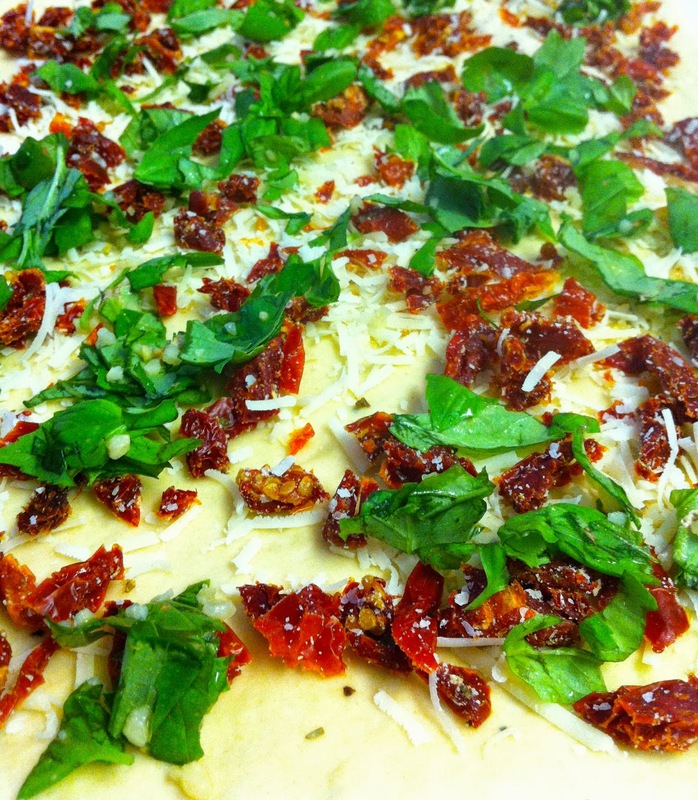 For the filling, combine the sun dried tomatoes and parmesan cheese in a small bowl. In another small bowl, combine the fresh basil and minced garlic. 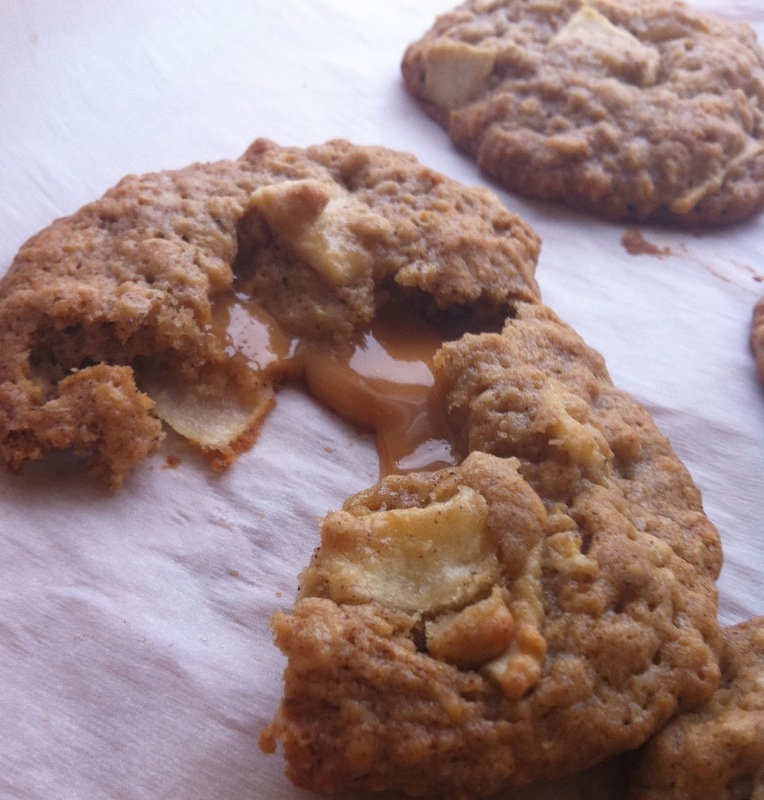 Punch the dough down and knead out the air bubbles. Roll the dough out on a floured surface into roughly a 10 by 24 inch rectangle (you may need to pause while rolling it out to allow the dough to relax out into shape). 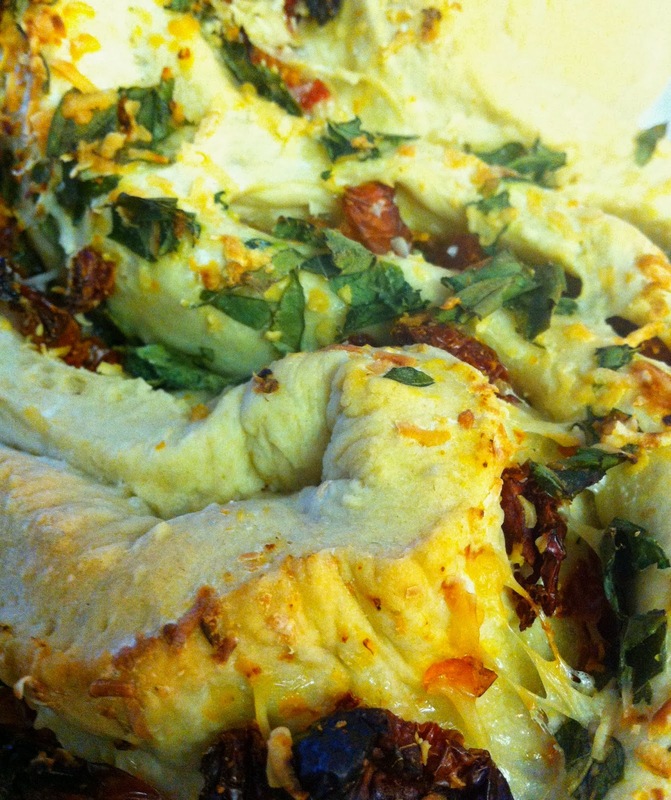 Sprinkle the dough evenly with the tomato and cheese mixture, followed by the basil garlic mixture. 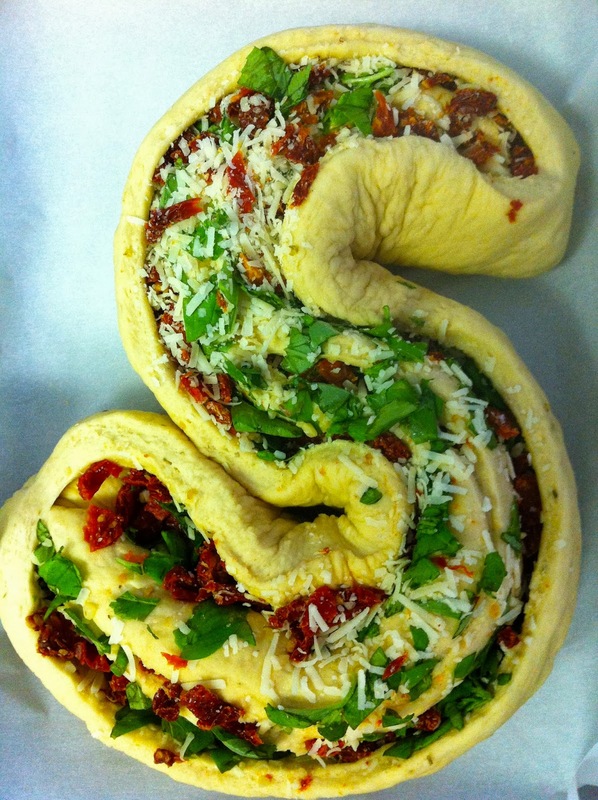 Starting with the long end, roll up the dough up tightly into a log. Pinch along the long seam and at both ends. Place the log seam side down onto a baking sheet covered in parchment (this is REALLY great for making sure the bread doesn’t stick at all). Using a serrated knife, cut along the top of the log (I cut through the top and second layer of dough…definitely do NOT go all the way through!). Curve the log into an S shape (this helps the filling stay where it’s supposed to). Allow the log to start rising about 30 minutes. While doing this preheat the oven to 350. Bake for 20 minutes. 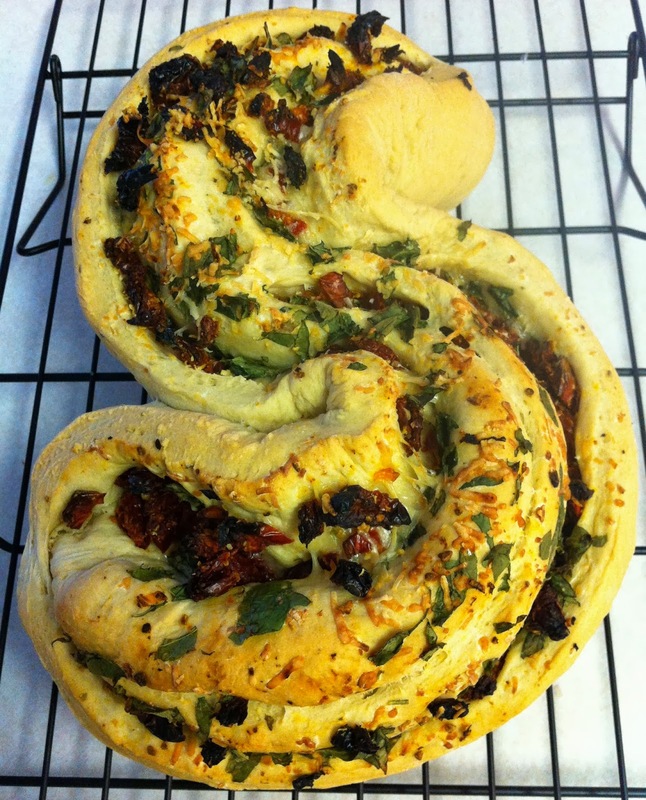 At this point, you might want to cover the loaf with tin foil (the sun dried tomatoes get toasty quickly). Return to the oven and cook about 15 minutes longer. The loaf will be golden brown on the top and bottom and sound hollow when tapped with you finger. 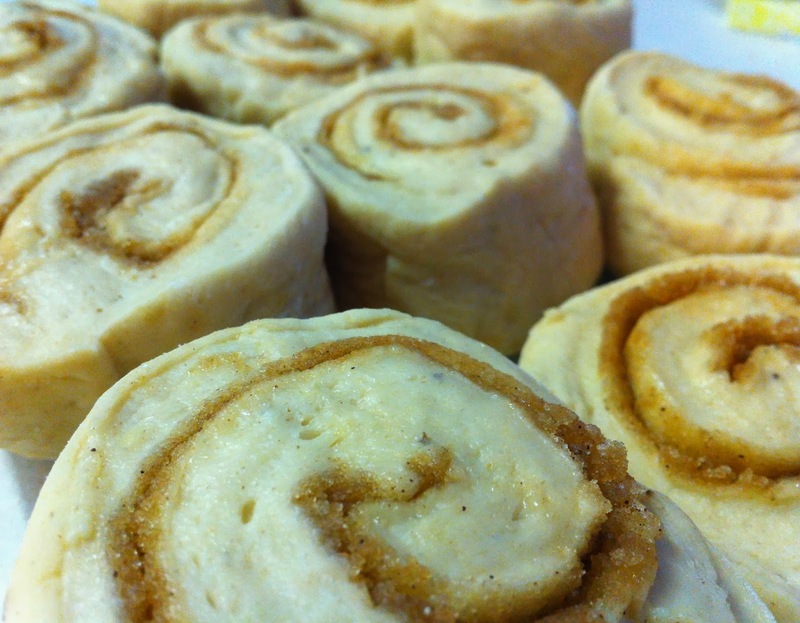 Rolled and cut…ready for the oven!